* Microprocessor circuit assures maximum possible accuracy, provides special functions and features. * Records Maximum and Minimum reading with RECALL. * Low-friction ball vane wheels. * Build in temperature ℃, ℉ measurement. * The portable anemometer provides fast, accurate readings and the convenience of a remote sensor separately. * Multi-functions for air flow measurement : m/s, km/h, ft/min, knots. mile/h. 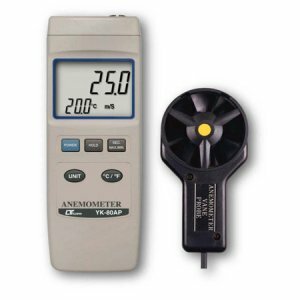 * Wide applications: use this anemometer to check air conditioning & heating systems, measure air velocities, wind speeds, temperature...etc.